call 403-287-2299 or email us. 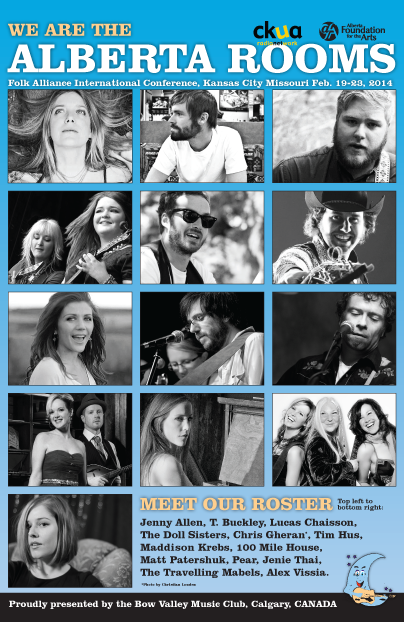 Individual concert tickets to all available concerts are sold online by brownpapertickets.com. Individual tickets cost $31.00 plus GST. Additional convenience fees also apply for online and credit card purchases. The following table is meant to give an indication of ticket availability to our shows and is updated periodically, as best we can. However ticket sales can change quickly and we may not always have this table up to date, therefore, there is no guarantee of ticket availability meant or implied by the following table. We do not normally sell tickets at the door so please obtain tickets well before our concerts. Thanks! 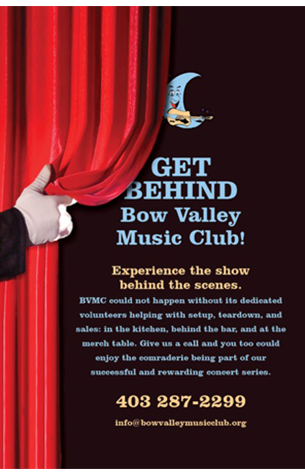 Bow Valley Music Club is an adult venue for 18 and over age only. Go to Ticket Exchange to list your tickets to sold out shows. t them directly if you are interested in buying their tickets. Keep in the loop on concert news and information.